This is a fantastic example of the classic Kirby first page. 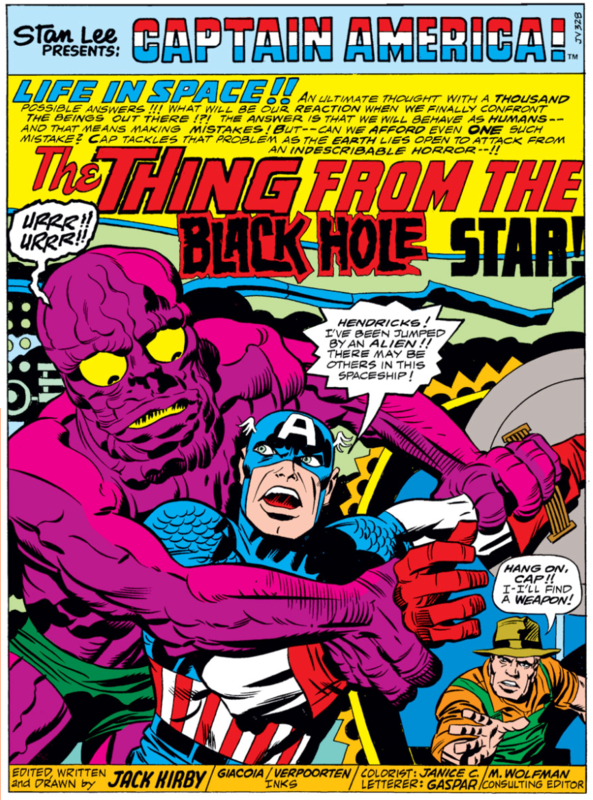 The opening prologue is punctuated with loads of dramatic Kirby Crackle. And, then, there’s that alien. Oh, the alien. Is it just me, or is that alien just a little too excited? Best of all, Cap’s sidekick in this issue is … Hendricks. HENDRICKS! I love it. Start the petition now. We want a “Hendricks: Origin” Limited Series! LOCAL ANCHOR MAN: What happened today, Mr. Hendricks? HENDRICKS: Well, suh, I was tending to my fields, bustin’ up some chiffarobes and whatnot, and this great big flyin’ saucer come out of the sky and landed in mah field. I went inside and a big pink alien was tryin’ to make the animal husbandry on Captain America hisself. I just knew, I needed to find a weapon and kill me that alien. So, I done it. LOCAL ANCHOR MAN: You are a true, American hero, Mr. Hendricks. This entry was posted in 1 and tagged Captain America, Comic Books, Comics, Jack Kirby, Marvel. Bookmark the permalink. Somehow you withstood the temptation of bringing up the fact that this alien is from the, um … “black hole” star.